Another bird, coincidentally black in colour, is found in the same kind of desert areas as the Black Phoebe. The Phainopepla is not related to the Black Phoebe but to a family of birds known as Silky Flycatchers (not related to the true flycatchers either). This New World family consists of only four species of which the Phainopepla is the most northerly extending its range well into the USA. The only other member of the family to be found in the USA is the Grey Silky Flycatcher which strays into the country along the Mexican border. Silky Flycatchers physically resemble waxwings and for many years were included in same family. The Phainopepla behaves like a typical flycatcher in that it sits quietly on a prominent perch from which it flies out to snag flying insects. Unlike true flycatchers the Phainopepla is a voracious fruit eater. Small flocks will gorge themselves on elderberries found along riparian woods. This preference for berries is one of the main reasons that the Silky Flycatchers were originally lumped into the same family as the waxwings. When elder berries are not in season or when eaten by the birds themselves, lone males will fly into drier areas and lay claim to the parasitic desert mistletoe found hanging from Mesquite trees. 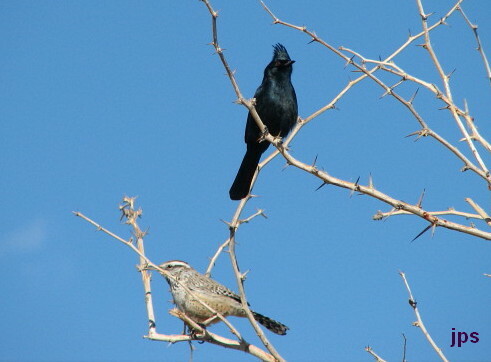 Although the mistletoe berries are poisonous they do not seem to bother the Phainopepla at all. When driving along a desert road it is a common sight to see a lone male Phainopepla fiercely guarding his “berry patch” against all comers. The Phainopepla is very easy to identify in the field. 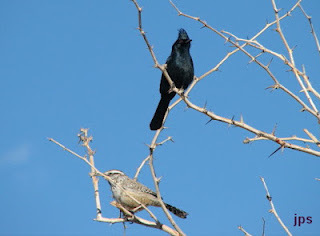 It is a slender sparrow sized black bird with a perky crest and long tail. Its habit of sitting conspicuously out in the open makes it very easy to observe and photograph. In good light the male’s coat gives off a bit of a sheen that gives rise to the family name “silky”. 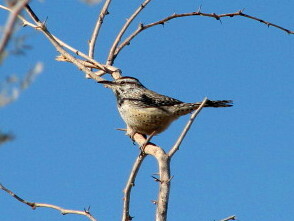 In contrast to the male the female is a grey-brown version of the male’s. Both sexes show distinct white wing patches near the tips of their wings (visible in flight only) and both have red eyes. The red eyes are more distinctive in the male. 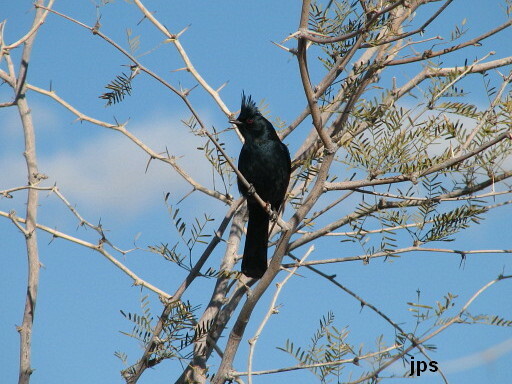 An interesting piece of trivia is that this is one of only a few birds that does not have a common “English” name, rather it carries its scientific name, Phainopepla. For example, if our Robin did not have a common name it would be called “turdus”. Now, that would raise a few eyebrows. This week’s photo was taken in the desert on the outskirts of the Joshua Tree National Park in California.